One thing that’s been on my mind lately is the fascinating way that technology is changing the lives of various generations. Previously, I wrote about designing for the generation who did not grow up with the Internet. Just thinking of my own family, I remember when my Grandmother got a little piece of hardware that only let her do email. I can’t remember what it was called. But, it was pretty cool to get emails from her. This was probably about 20 years ago! Now, my 84 year old Grandfather has an iPhone and knows how to Facetime, send photos, use Siri, dictate messages, use all kinds of golf apps, and more. My parents both have had iPhones for at least two years and just the other day my mother said that almost day doesn’t go by where they don’t use their phones to message each other. That was kind of shocking to me. Especially given that when I left home to go to college, one of the last things I did was sit my mom down at the computer and write out instructions on a piece of paper so she would known how to turn the computer on, check her Hotmail, and do a Google search. At the other end of the spectrum, there’s the generation who’s only every known life with the Internet. And now, a generation who’s never known life without a touchscreen. We’ve all seen kids in strollers playing on iPhones. I’m still not sure how I feel about that. Having access to constant simulation, interaction, and information is great, but it has to come at some cost to childhood development. Wired Magazine recently had a great article about The Moth Generation which is the term used to describe this younger generation who’s never known life without a touchscreen. Why the name “Moth”? Well, when you think about it, moths gravitate toward the light. In the article, the author talks about how children, even when surrounded by interesting “offline activities” gravitate towards the touchscreen. For example, the author recounts a birthday party where there was a magician and the children didn’t watch the magician, the gravitated toward the child who had a smartphone. Crazy, right? Watch It: See how a generation who grew up without the Internet reacts to Google Glass. Just as easily as the younger generation is adopting technology, the older generation is adopting technology too. 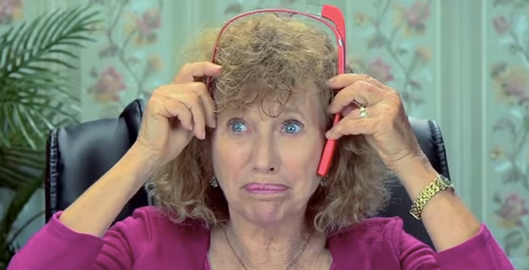 I recently stumbled upon this great video of older people and their reaction to Google Glass. It’s a great watch and their reactions to Google Glass are really insightful. It’s definitely worth a watch regardless of if you’re a UX designer or not. I’m curious about your reactions and observations about how the older and younger generations are adopting technology. Do you have kids? If so, what have you noticed about their interactions and affinity toward touchscreens? If you’re older or have older parents or family members, what have you noticed about their adoption of technology? Please share your ideas and insights in the comments below!